I love hearing stories about the favorite recipes in families. It’s always interesting to ask someone “what was the best thing your mom cooked?” (replace mom with dad, grandma, aunt — whatever you’d like). Almost everyone has something to share or say about those foods they ate when they were younger. The smells, tastes, and sights of yummy bites that have been etched into their memories. 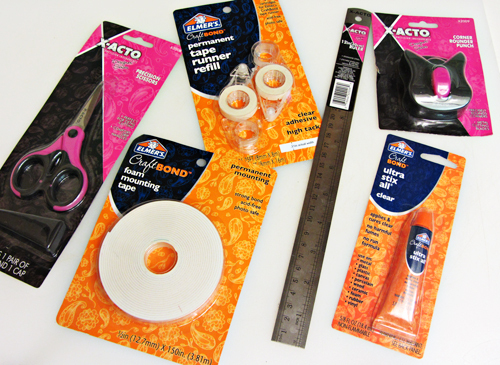 The DIY project I share with you today is with all this in mind. 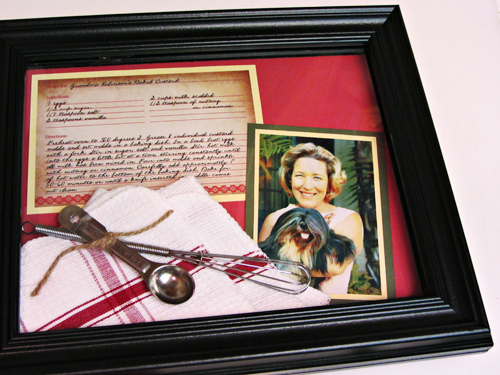 The idea is to take a single recipe that has strong memories for you and create a display. 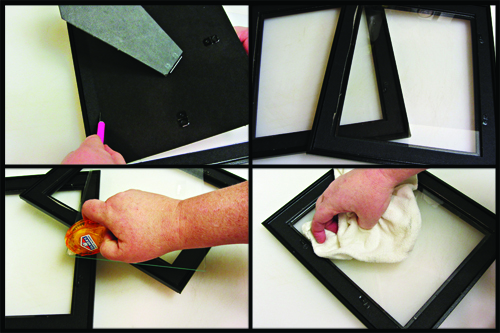 I’m also excited to show you how to make your own shadowbox frame from two standard frames — I used two $3 frames. There is so many ways you can create this project, but I will show you how I did it and you can take it from there. 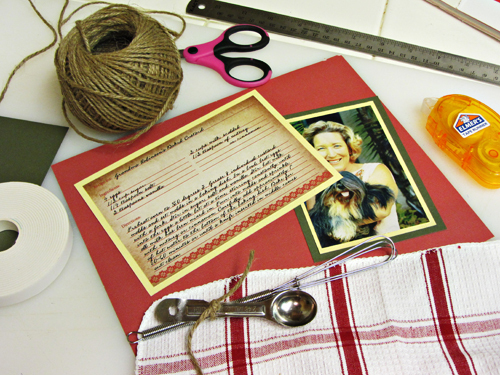 First, take an old family recipe card, or create a new recipe card from an old family recipe. You can make one by hand, or if you have Photoshop, I have instructions on how to make a recipe card in Photoshop (which is what I did). 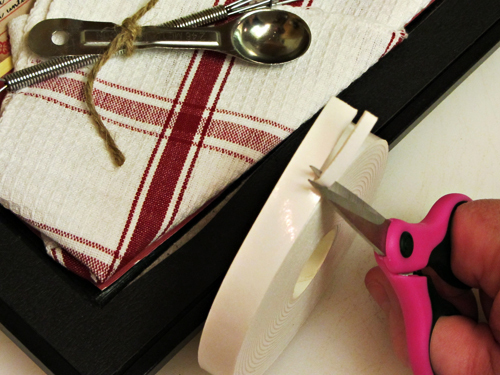 Print the recipe card on cardstock. I also printed out a photo of my Grandma to use. Now that they are printed, I must trim them. There are many ways to do this, but for this project, I am using my X-ACTO Gripster Knife and X-ACTO Metal Ruler. 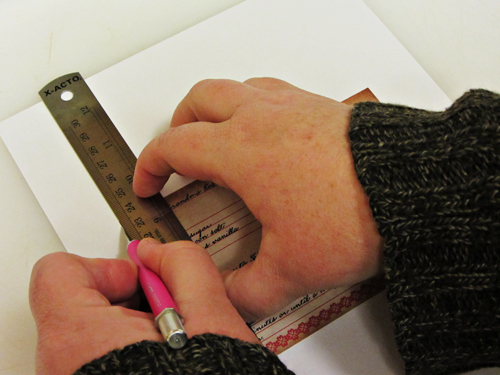 While working on a protected surface, I firmly hold the metal ruler down where I will want to make my cut. I use the knife to carefully cut along the ruler. I did this with both my photo and my recipe card. Next, I removed the thin cardboard backings from both of my frames. The backings on my frames were like a hinged door, so I used my X-ACTO knife to cut them off. I also removed the photo mat and the faux family photo came with my frames. I (very carefully) removed the glass from one of the frames and I ran the Tape Runner along the edges. I did this to secure the glass inside of the frame. You may also be able to use a strong double-sided tape or a glue that is suitable for glass. I placed the glass back into the frame and then using a towel, I pressed firmly to make sure it was secure and to buff out any fingerprints. 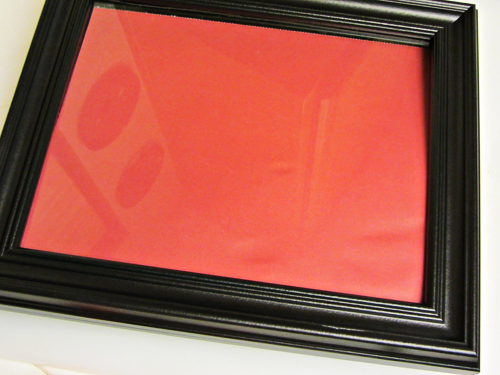 I chose red cardstock for the background of my shadowbox. 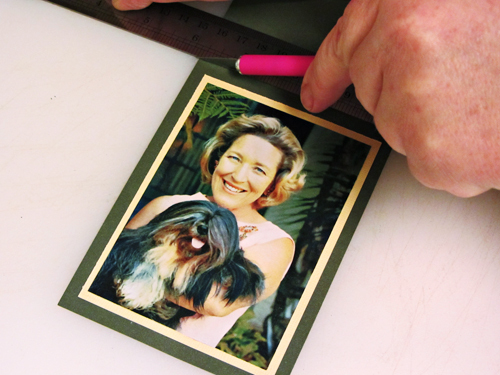 To measure the size needed, I used one of the photo mats that was included with my frame and traced it. I then cut it out using the same technique I did with the photo and recipe card. 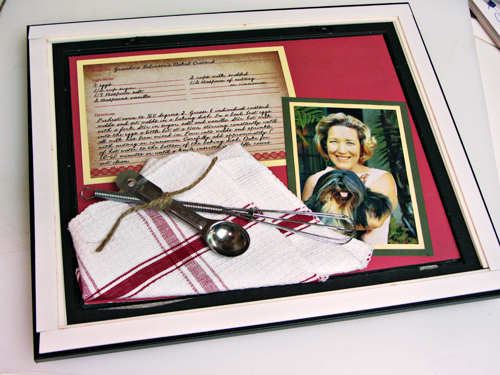 I created photo mats for my photo and for my recipe card. To do this, I cut rectangles that were slightly larger than my photo and then centered the photo in the middle of the rectangle. The photo received 2 photo mattes (see the beige and the green below), and the recipe card was given one. 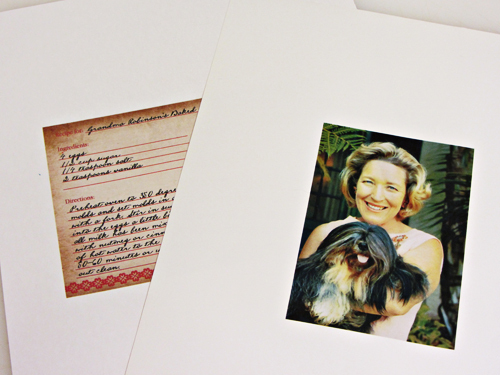 The photo and the recipe card were adhered to the mattes with the Elmer’s Tape Runner. I am ready to start assembling it! I pulled everything together and start laying out the pieces (without glue at this point) to display them in a way that felt right. I had an old measuring spoon and a mini whisk that I tied together with twine, plus I am going to be putting this dishcloth in the shadowbox as well. 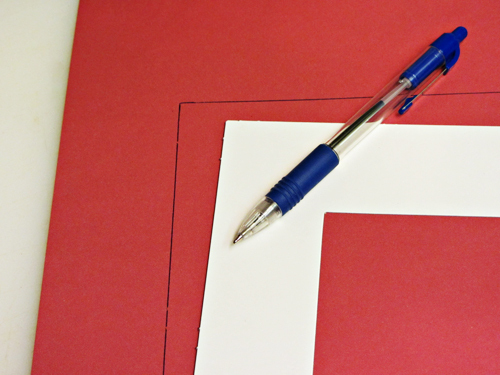 Once I was happy with the look, I began adhering the pieces to the top of the red background paper. 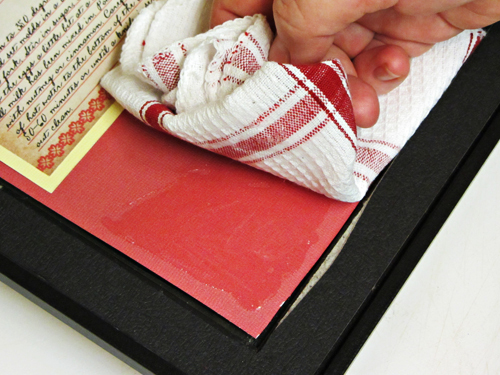 This red background paper was placed on top of the glass in one of the frames. You want the plain side of the red cardstock touching the glass, but the actual design is facing what used to be the old back of the frame. 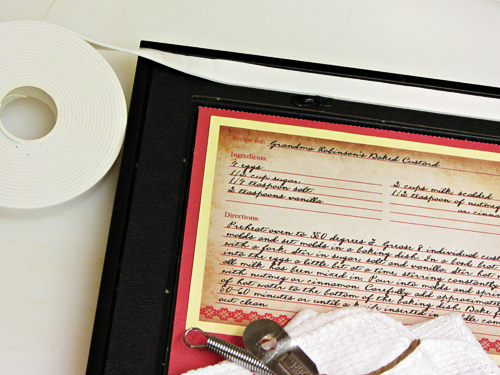 I adhered the photo and recipe card to the red background with the Tape Runner. The dishcloth was adhered with Elmer’s CraftBond Clear Dual Tip Glue Pen. I didn’t need a lot of glue as I know the cloth will be very snug once I put the top frame on. 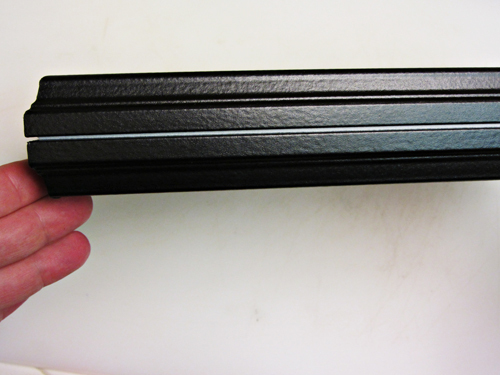 To secure the measuring spoon and whisk, I cut a small, but long, rectangular piece of foam tape. This rectangular piece of foam tape was placed on the back of the whisk. I also placed a small square of foam tape on the back of the measuring spoon. 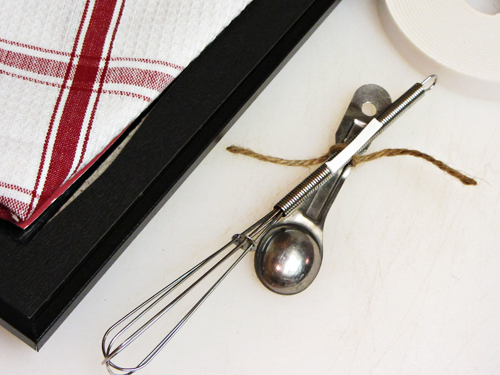 The spoon and whisk were then placed back into the display. Once the display is completely finished, it’s time to add the foam tape to the edges of the frame and place the top frame on. The foam tape is what will secure the two frames together. I took the foam tape and lined along all edges, but not right on the edge of the frame. For the frames that I bought, I needed to do 3 layers of the foam tape — each one right on top of the one before — so that it was thick enough. This will vary on frames…you may only need one layer, or two layers. It depends. Here’s how my frame looks after the 3 layers of foam tape, but before I add the other frame on top. With great care, I placed the second frame on top of the other one. It’s very important to be careful during this part because the foam tape is very strong. If you place the frame on crooked, you might have difficult removing it and correcting the placement. Please note: The previous “backs” of the frames are placed together in this step. The fronts are facing outward. The frames are creating a “sandwich” with the middle being filled with ingredients. And here’s a look at the back. This part won’t be seen when it’s hanging on a wall or sitting on a shelf or mantle. 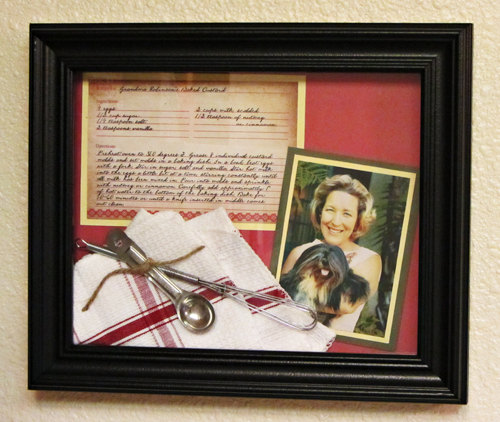 My recipe card shadowbox frame is finished! This project has been compensated as part of a social shopper insights study for #ElmersHoliday #gluenglitter #collectivebias #CBias. All opinions, as always, are 100% my own. I made something similar, sans picture, for my BFF’s eldest daughter. It was a copy of my mom’s pumpkin pie recipe. There is a sweet funny story about Ann and one of the pies and when she got older my mom made her two for her birthday. 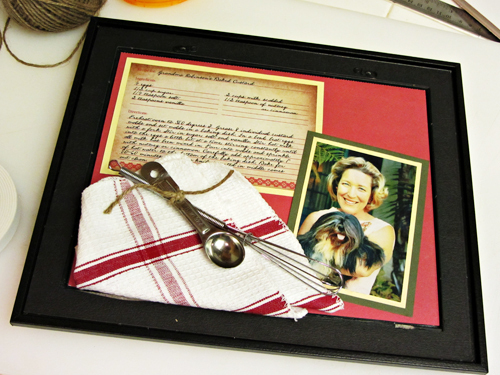 Sharing recipes and pictures is a nice way of keeping the memory of a loved one alive. LOVE this idea! 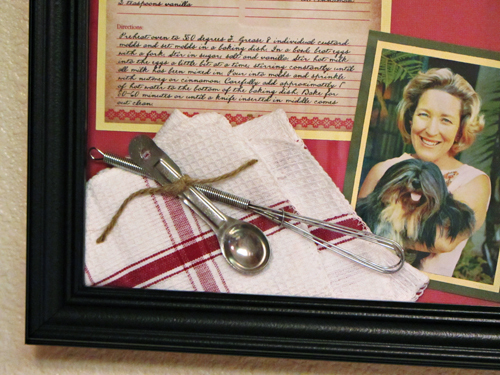 The recipe for sure, but making the shadowbox from two picture frames is a fabulous idea! Thanks for sharing. What a beautiful frame and a wonderful keepsake! This is beautiful! I could see making this as a new baby gift as well by just adding a little rattle or toy. Priceless. I recently made a recipe book of our family recipes but this is really something special. Love it. This is brilliant! I totally am going to do this with my grandmother’s recipe and maybe even as a gift for my mom next year. I am also pinning this so I don’t forget! Oh my gosh, that is beautiful! What a lovely gift that would make.